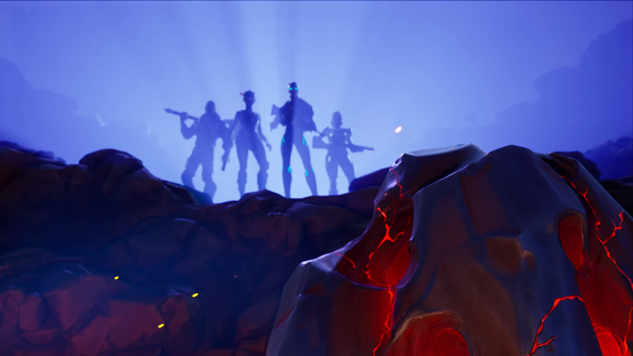 After an extensive overnight update, Fortnite returned on Tuesday to kick off the game’s fourth season of content, bringing with it the most changes to the title since its expansion into the battle royale sphere. The emergency broadcasts inundating the game’s televisions proved true, as the tease of an alteration to the battle royale map came to fruition, thanks to the growing number of comets, but not the region everyone suspected. Tilted Towers still stands, but Dusty Depot is no more after a large comet impact, reducing the area to its new namesake, Dusty Divot. The comet’s impact did leave behind a curious new consumable item called Hop Rocks, which allow players to defy gravity by altering their jump physics. While Dusty Depot is no more and the battle royale map will have plenty of smaller craters across the board, it is also getting a new area: Risky Reels. Situated just above Wailing Woods, Risky Reels has the appearance of a drive-in movie theater that saw better days before the sky fell. There will surely be some complaints from players, as the new region’s location was formerly a popular landing spot, but it is exciting to see the map evolve as its popularity explodes. Other highlighted changes include the dropping of the crossbow, the prioritizing of headshots and a new Battle Pass, including all of the new emotes and cosmetics one would expect from the game. The series of superhero teases released by Epic Games factors into Fortnite’s Save the World mode with a new superhero-themed campaign called Blockbuster Event. The game’s original PvE mode is receiving a copious amount of additions and updates, including new weapons, enemies and heroes, as well as changes to mechanics of the game, such as having enemies drop loot once defeated. These details only scratch the surface of what’s included in Epic’s latest patch notes, but it’s refreshing to see the developer not shy away from doing something completely different while slowly evolving both modes of the game. It remains to be seen if players take to the changes, but, luckily, there’s no wait, as Season 4 is live right now. Check out the Season 4 trailer below.